This site is now migrated to http://nw.arlisna.org/. Please visit us there! The ARLIS/NA Northwest Chapter is looking for a new visual identity and needs your help in designing a new chapter logo. This is an exciting time for our chapter as we prepare to host the joint ARLIS/NA-VRA Joint Conference in Seattle in 2016. The winning logo will be used on the Chapter’s website, Facebook page, documents, promotional materials, and more. * Our Chapter includes: Alaska, Alberta, British Columbia, Idaho, Oregon, Washington, and the Yukon Territory. The contest is open to individuals, and membership in ARLIS/NA is not required. The contest is not open to companies, educational institutions, or organizations. The deadline for submissions is June 1, 2015. The winner will receive a cash prize of $200. The winner will be selected and notifications will go out no later than Friday, June 26, 2015. More details, including submission guidelines and tidbits about our chapter, are found on our Chapter Website . Please submit questions to Traci Timmons, Chair, ARLIS/NA Northwest Chapter, at tracit@seattleartmuseum.org. * Please note this design will be used for NW Chapter materials only; this is not the design for the joint conference logo. 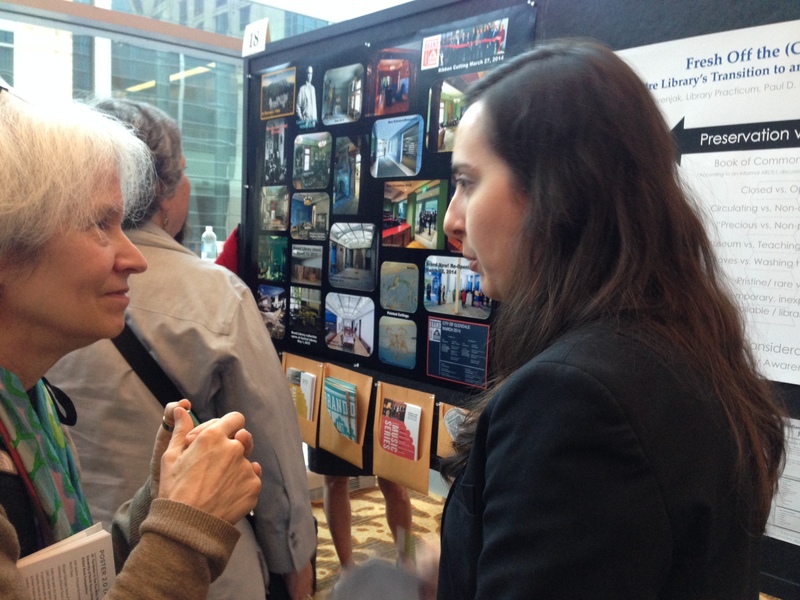 Nicole Lovenjak, Library Practicum at the Paul D. Fleck Library and Archives at the Banff Center, won the travel award to the annual ARLIS/NA conference. Check out her report of her experience here! It was great to see so many Northwest Chapter members at the recent 2015 ARLIS/NA Conference in Fort Worth. We had a well-attended Chapter Meeting for which you can find the meeting minutes here. I wanted to acknowledge the achievements of some of our members. Design Students Unlock Open Access — Sarah Polkinghorne, Subject Librarian for Art & Design, Drama, and Psychology, University of Alberta. Learn more here. Fresh Off the (Closed) Shelf: The Banff Centre Library’s Transition to an Open Stack Artists’ Books Collection — Nicole Lovenjak, Library Practicum, Paul D. Fleck Library & Archives, The Banff Centre. View her poster here. 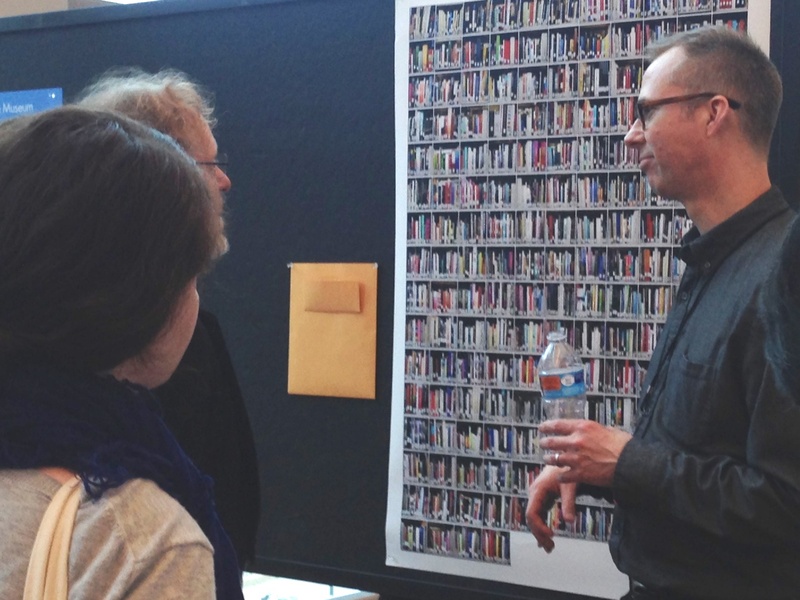 The N Project: Leveraging Social Media to Promote Collection Material — Dan McClure, Director of Library Services, Pacific Northwest College of Art. See more on the project here and here. The Role of the Library in the Research-Creation Process of Fine Arts Undergraduate Students at the University of Victoria — Tad Suzuki, Learning & Research Librarian (Fine Arts), University of Victoria. Something Old and Something New: Building a Special Collection of Artists’ Books —Anna Korus, Library Manager, MacEwan University, Edmonton, Alberta; Roxy Garstad, Collection Assessment Librarian, MacEwan University, Edmonton, Alberta. For the session, Linked Open Data: Interconnectivity Amplified, Sarah Seymore, Digital Metadata Technician, and Julia Simic, Metadata and Digital Production Librarian, both of the Digital Scholarship Center at the University of Oregon Libraries, presented on: Migrating to Linked Open Data: The University of Oregon’s Approach. See the Oregon Digital site and the code repository to learn more. Chapter Vice Chair/Chair-Elect and 2016 Joint Conference Co-Chair, Alan Michelson, gave a great presentation on the upcoming Seattle conference at the Membership Meeting that was very well received. 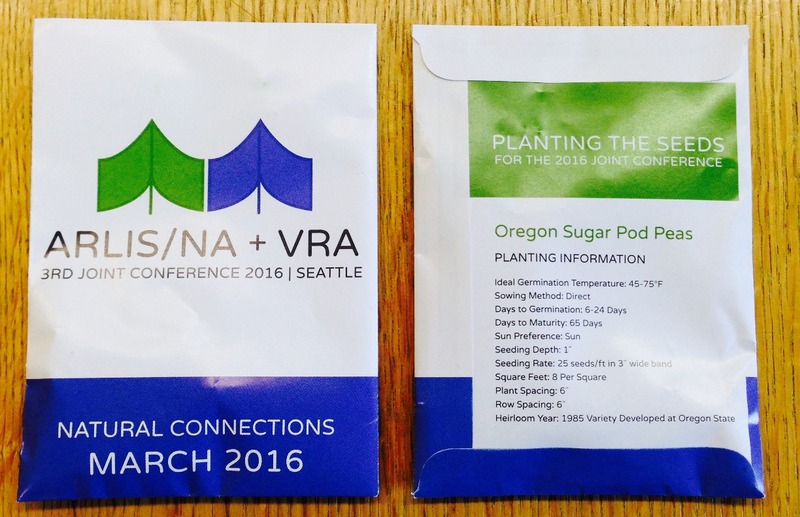 We also had our first chance to show off the “Natural Connections” Joint Conference logo design created by Rachel Kopel and pique people’s interest about 2016 Seattle conference with these Oregon pea pod seed packets. In general, people are excited about coming to Seattle and being in a “green” setting (as I heard it put). Thank you so much to Debra Royer, Paula Farrar, Christine Sundt, Eileen Markson, and Sylvia Roberts for these generous and creative gifts. Thank you all for your great contributions. 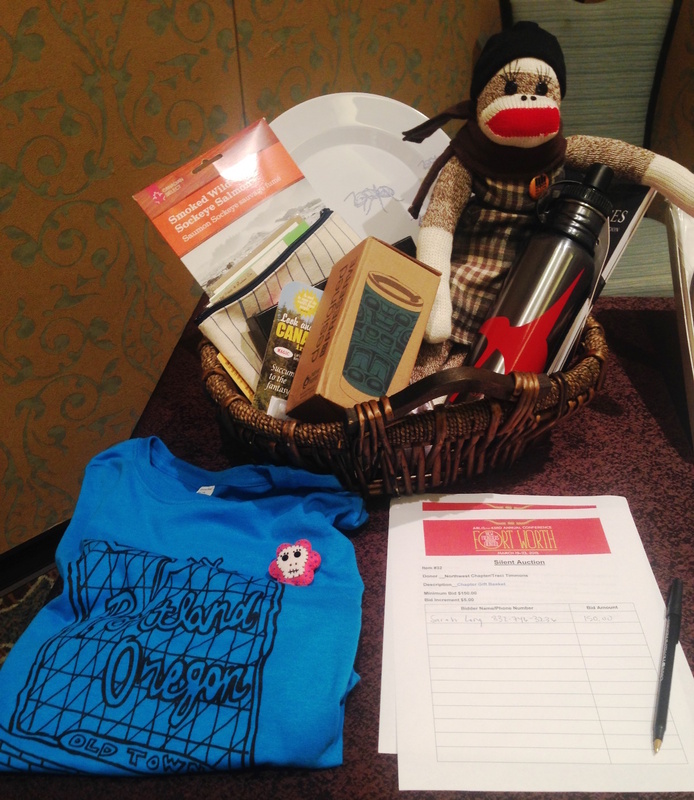 The ARLIS/NA Northwest Chapter is looking for a new visual identity and needs your help. This is an exciting time for our chapter as we prepare to host the joint ARLIS/NA-VRA Conference in Seattle in 2016. The winning logo will be used on the Chapter’s website, Facebook page, documents, promotional materials, and more. Complete entry information is here. Jenna Dufour, MLIS candidate at the University of British Columbia, won the travel award for the chapter’s annual meeting in Seattle, November 7-8, 2014.